The inflammatory bowel diseases (IBD) are conditions regulated by a combination of genetic, immune and microbial factors. Although it is a normal component of host defense against pathogens, neutrophil influx to the intestinal lumen is also associated with severe pathology in IBD. In a recent manuscript by Szabady et al., the authors demonstrate a novel role for endocannabinoid compounds in regulating intestinal inflammation by limiting neutrophil migration and tissue damage1. Previously, using a model of Salmonella typhimurium infection, the researchers showed that neutrophil migration into the intestinal lumen is induced by secretion of the eicosanoid chemoattractant hepoxilin A3 (HxA3) through the apically-restricted efflux pump multidrug resistance protein 2 (MRP2)2. Interestingly, the expression of another luminal transporter, P-glycoprotein, is downregulated at the epithelial surface during S. typhimurium infection3. Encoded by the multidrug resistance transporter P-glycoprotein (Mdr1a) gene, defects in function or expression of this protein have been shown to have a role in the development of IBD, highlighted by the observation that Mdr1a knockout (KO) mice develop spontaneous colitis4. This led the investigators to hypothesize that P-glycoprotein may efflux compounds which counter the effects of the HxA3/MRP-mediated neutrophil migration and have a role in maintaining intestinal homeostasis. Szabady et al. found that endocannabinoid compounds are secreted into the intestinal lumen by the P-glycoprotein. Using using a dextran sodium sulfate (DSS) model of colitis, the researchers demonstrated that increased levels of intestinal HxA3 drive inflammation following disease induction. 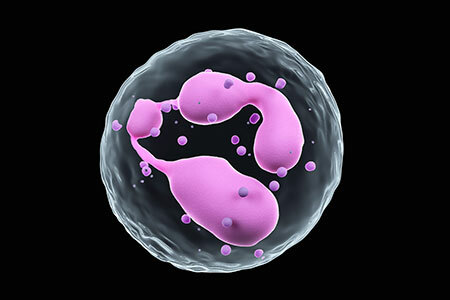 When P-glycoprotein expression was either knocked down or inhibited, this led to reduced intestinal secretion of endocannabinoid compounds and resulted in increased neutrophil migration using in vitro and in vivo measurements. To further demonstrate the role of endocannabinoids in preventing inflammation, mice deficient for the peripheral cannabinoid receptor (Cnr2) were used in the DSS colitis model. In the absence of endocannabinoid signaling through the peripheral receptor, researchers found greater levels of intestinal pathology and neutrophil infiltration following disease induction compared to control animals. Thus, endocannabinoids secreted through the multidrug resistance transporter P-glycoprotein have anti-inflammatory effects that aid in maintaining intestinal homeostasis. The findings presented by Szabady et al. are notable for being one of the first, if not the only, groups to identify endocannabinoids as the first endogenous substrate of the multidrug resistance transporter P-glycoprotein, and that these lipids have both anti-inflammatory properties and a role in controlling neutrophil responses in the intestine. 1. Szabady RL, Louissant C, Lubben A, et al. Intestinal P-glycoprotein exports endocannabinoids to prevent inflammation and maintain homeostasis. J Clin Invest. 2018. Aug 13. [Epub ahead of print]. PMID: 30102254. 2. Pazos M, Siccardi D, Mumy KL, et al. Multidrug resistance-associated transporter 2 regulates mucosal inflammation by facilitating the synthesis of hepoxin A. J Immunol. 2008. Dec 1;181 (11):8044-52. PMID: 19017997. 3. Siccardi D, Mumy KL, Wall DM, et al. Salmonella enterica serovar Typhimurium modulates P-glycoprotein in the intestinal epithelium. Am J Physiol Gastrointest Liver Physiol. 2008;294(6):G1392-G1400. PMID: 18403618. 4. Panwala CM, Jones JC, Viney JL. A novel model of inflammatory bowel disease: mice deficient for the multidrug resistance gene, mdr1a, spontaneously develop colitis. J Immunol. 1998;161(10):5733-44. PMID: 9820555.